The Gigabyte AORUS AD27QD is a very versatile monitor. It can be adapted to various scenarios, viewing angles and configurations in order to best suit the user. The weight of the whole monitor unit is supported by a solid metal base stand, which allows the display panel to remain extremely sturdy. The stand is removable, allowing the user to have access to the VESA compatible mounts on the display panel itself. Moreover, the stand is also specially designed to receive power and RGB light signals from the main display unit, as it also possesses some RGB lights to fit the gamer’s mood. However, we found out that sometimes, there could be poor contact between the main stand and panel, causing the RGB lights to flicker. We had to remount the whole display unit in order for the RGB lights on the stand to work properly again. The unique design of the stand allows the whole display panel to be adjusted. More specifically, the monitor can be tilted, swiveled, height adjusted and turned. Here are some images of the monitor at each of its different adjusted states. On first look, it seems like the AORUS AD27QD has a totally bezel-less display. However, upon closer inspection, we saw that the bezels were actually below the main glass. Although not perfect, this design looks good as well. What I did not understand was that there was quite a big gap between the main glass panel and the plastic enclosure. After a few wipes on the display, we found that dust and other particles will be trapped within the gap. We would consider this as one of the main flaws of this monitor. The AORUS AD27QD comes with 2 x USB 3.0 ports (out), 1 x display port and 2 x HDMI ports. The monitor also comes with a headphone and microphone jack as well. We immediately realised that it won’t be straightforward for users to connect their USB peripherals or headphones/mic to the monitor, as it will require them to look to the back of the monitor and look out for the ports. It would have made more sense if the design decision was to place these ports at the sides of the monitor for easier access. Just based on the bare specifications, it seems that the AORUS AD27QD Gaming monitor seems pretty standard like any other gaming branded monitors in the market. It is a 27-inch display at a QHD 2560 x 1440 resolution, which also means that it retains a mainstream 16:9 aspect ratio. This resolution falls between the usual FullHD 1080p and 4K resolution. This means that we probably don’t need a crazily expensive and powerful graphics card to drive this monitor as well. The AORUS AD27QD is also DisplayHDR 400 certified. HDR capable displays can deliver better contrast and colour accuracy when compared to standard dynamic range displays. Essentially, they are able to produce a higher range of colour than the usual display, thus allowing them to create a more lifelike and accurate picture. For more information about the DisplayHDR standard and the qualities of the DisplayHDR 400 certification, you can visit the link here. This monitor also has support for AMD’s Radeon FreeSync technology. Essentially, FreeSync allows the monitor to work together with the graphics card and synchronize the refresh rates between the two. This essentially removes the possibilities of image tearing and artefacts under any kinds of frame-rates, thus enabling a smoother gaming experience. Also, since NVIDIA has enabled adaptive sync support in their latest drivers, both NVIDIA and AMD graphics card will be able to enjoy such a feature. Gigabyte selected an IPS panel for the AORUS AD27QD, allowing gamers to have an uninterrupted gaming experience on the display. 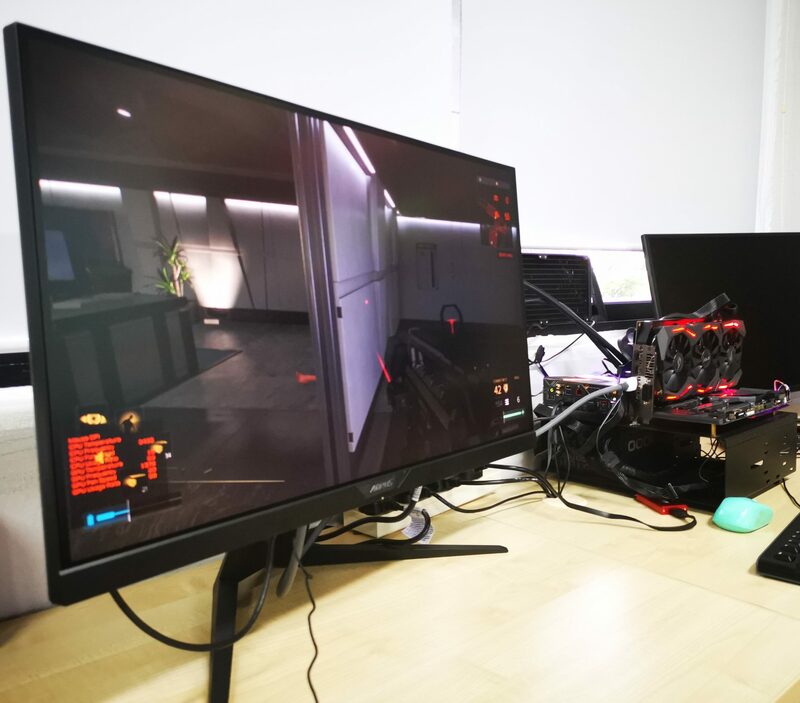 Thanks to IPS technology, the monitor is also able to achieve a very wide viewing angle, making it suitable for multiplayer games where many players are looking at the same screen from different areas. They have also selected a non-glare display surface for this display, making this model suitable for other use cases other than gaming as well. the monitor also settles with a 144Hz refresh rate, which in our opinion, should be the bare minimum for what is expected of a gaming monitor these days. The Gigabyte AORUS AD27QD has all the key attributes of what a gaming monitor should have. Now that we have gotten these details settled, let’s find out if the various designs and features on the AORUS AD27QD really makes it, as how they put it, “tactical”. Can the monitor really give an edge to gamers? There are two ways to change the settings on the AORUS AD27QD Gaming monitor. Primarily, gamers can access all the settings of the monitor by pushing the main “joystick” button on the monitor. Secondarily, they can also download the OSD Sidekick software from Gigabyte’s website to do the same. Maneuvering between the different settings on the AORUS AD27QD is done via the directional “joystick” on the monitor. When toggled, the on-screen display will show exactly how to get access to the different settings. However, this operation may require some getting used to, as some selection of settings are based on the instructions shown on the screen and are not directly intuitive. Users can even set shortcuts to the “joystick” to have quick access to certain settings. Even though the navigation of the settings on the monitor could be confusing sometimes, having only a single button on the whole monitor makes the whole design of the monitor simple and clean. If a simple graphical user interface is preferred, you can always download the OSD Sidekick software to change the monitor settings just by a few clicks. On a side note, OSD Sidekick can only be used when the monitor is connected to the PC via USB. This also means that all data communications between the monitor and the OSD Sidekick software is done via USB. The software includes a comprehensive list of settings of the monitor. Furthermore, it can even help you to update your monitor’s firmware when newer versions are available. Some settings, such as Active Noise Cancelling (ANC) positioning for the microphone and hotkey management can only be accessed via the OSD Sidekick software. Essentially, this software would make it a lot easier and more natural to configure the monitor, instead of having the need to figure out how the physical joystick works. There are a couple of features that Gigabyte has included in the monitor that tries to aid gamers in their games. Let’s do a walkthrough of each feature. Black Equalizer lights up the darker parts of the game in order for the gamers to see clearly in dimly lit virtual environments. For this feature, we found it to be rather useful, as it is now possible to better conduct terrain appreciation and better strategize your game accordingly. This feature is more for FPS games, where the understanding of the environment is important to the decisions you make. However, we do realize that by increasing the black equalizer, the images may look rather unnatural, and in fact, sometimes too bright that it can be deemed as a drop in image quality. Aim Stabilizer helps to reduce the blur caused during fast paced FPS games. Based on our tests, it does slightly help in reducing the “sense of recoil effect”, but there is nothing too drastic. It could be likely because we were already gaming in 144Hz, and that the high frame-rate already resolves the blur issue when we were rapid firing the shots. Game Assist allows multiple on-screen display statuses to be shown. Gamers can add an additional customizable crosshair, a counter, a timer and alignment lines. We found the customizable crosshair to be quite useful, especially during moments of conflict. The crosshair helps the gamer to refocus on his/her target and better aim, with some games only showing a single dot as the crosshair. This does help in aiming in FPS games. Other features in the Game Assist OSD can be useful under certain circumstance, but we felt that gamers must pre-configure them to be activated by the hot-keys prior to their games to better utilize them. Else, these OSD could be seen as more of a nuisance than actual help to the overall game play. This dashboard shows a list of hardware information on the screen. Honestly speaking, unless you are an enthusiast running benchmarks on the system, this dashboard will be quite useless for you. The AORUS AD27QD actually comes with an integrated audio processor. This audio processor takes in audio either from the HDMI or Display port cables and pass them through to the 3.5mm audio jack found on the monitor. Moreover, it also features a microphone input as well. Gamers can also make use of the Active Noise Cancelling (ANC) feature provided by the monitor to cancel the noise in the environment, allowing for a clearer team chat. The system will detect the audio processor as a sound card when connected via USB. Based on our tests, we found the built-in sound processor to work particularly well in our games when the sounds are passed through from the video cable. It seems like the audio was able to reach a larger frequency range, creating deeper and more impactful lows and more distinct high, when compared to the onboard audio on the ASUS Zenith Extreme motherboard of our main system. However, we also realised that when the audio source came from USB, instead of video cable, there was always a constant noise heard in the earphones. Hopefully, this can be resolved in future firmware updates. The Gigabyte AORUS AD27QD is great gaming monitor, as it has all the fundamentals right – it runs at a 144Hz refresh rate, has FreeSync support, a high resolution of 2560 x 1440 and can even play HDR game contents as it is DisplayHDR 400 certified. Its build quality is not too shabby either. These core aspects place the Gigabyte AORUS AD27QD in the league of high-end gaming displays. However, being new in the market, the AORUS AD27QD also has certain areas which could be improved. For example, the USB ports and audio jacks could be placed in a more accessible area. The gaps between the monitor’s enclosure and display panel should also be reduced. Like it or not, we simply thought that most of the gaming focused features were rather gimmicky. RGB lighting on this gaming monitor also makes it look rather pretentious. Unless you are a competitive eSport gamer who only seeks for the best scores and outcomes, you’ll be better off with those features turned off than on, as they do somewhat affect the overall gaming experience. It’s also interesting to see a built-in dedicated sound processor in the monitor, but we felt that perhaps, a monitor should just do what a monitor should do, and nothing else. I would rather purchase a dedicated sound card to enjoy good audio, rather than looking at a gaming monitor. The built-in sound processor is a good to have, but definitely not necessary. Gigabyte has done it right by providing a high-end option for gamers in the market. If you game competitively and would like to take advantage of the gaming features on the AORUS AD27QD, there is no other products in the market that provides such an offering. These features do come at a price though, they the monitor retails at SGD888. For mainstream gamers, you’ll should probably look elsewhere, as you could probably get something at half the price with the same main display specifications. To summarize, if you are a competitive gamer, you can consider the AORUS AD27QD and make good use its tactical features. Otherwise, there’s definitely a more affordable alternative.